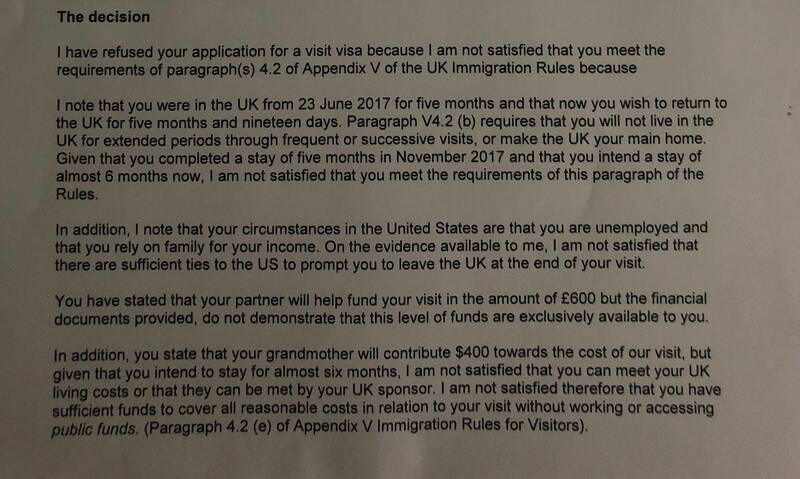 My boyfriend is due to come to the U.K. on March 14th from the USA, but has been denied his visitor visa (not sure why yet). Can he still enter the U.K. visa-free. Will he be denied entry at the border? By the time his flight comes around, it will have been 3 and a half months since his first visit, which was from June 23rd to November 28th. Initially it was only meant to be a month, but we kept postponing him leaving because, you know, puppy love and all that. And he got bad tonsillitis for about 2 weeks and my mum thought it “wasn’t fair” that he’d missed out on some time here. But the main meat of my question is, can he still be allowed to enter visa-free after being denied a visa? Also, he has Chilean dual citizenship. Could he enter and leave the U.K. on his Chilean passport, being a US citizen? UPDATE: Success! Thanks to fantastic advice from user Coke, we got together as much documentation as we could, cut his stay in half and after 1.5 hours detention, he was let through with advice from the IO that if he went through with our plans without deviation, he will have a much more lax time getting into the country next time. WHAT WE DID: We immediately started getting paperwork together. -Bank statements from his grandparents -Wage slips from my parents to show a healthy income. -A signed and notarised letter from his grandparents stating he has full access to all funds shown on the bank statement and that he does in fact live with them. -A letter from my parents stating they are very happy to have him over and can comfortably support him monetarily and otherwise, and he will not be any strain to accommodate. -A copy of his drivers license/learners permit to show proof of address. -The original refusal letter. -Proof of a return flight for June 12th -A list of phone numbers for me and my parents. Because one of the reasons was “attempting to live in the U.K. through frequent and successive visits.” We shortened his trip from 6 to 3 months, and planned for me to fly back with him to visit the states for three weeks. The IO referred to this, saying “I’m giving you the freedom to stay for 6 months, but if you go back on June 12th with like you say you’re going to, that will look really good on your record and if your partner goes with you, that will look even better because that’ll show integrity and honesty.” The IO did recommend that he brings the same documentation on the next few visits, just to be safe. To prove I went back with him, we’re going to photo copy my boarding pass and add that to the documentation. AT THE CUSTOMS DESK: The IO scanned the passport and asked “Have you applied for anything recently?” And my partner stated that yes, he had applied for a visa and got denied. He was then taken to detention. He asked a few questions such as -Why are you here? -How long are you staying -What funds do you have? -What are the plans for the future? He did ask the same question a few times, maybe in an attempt to get him to slip up in case he was lying. Also, as I was standing in arrivals waiting for my partner, I got a phone call from the IO, asking me questions in the following order -Are you expecting a visitor? -What is their name? -Obviously you know he was refused a visa, do you know what that was for? -What salary are you on? -Do you have any dependants? -Are your parents fine with having him over? -What do they do for jobs? He also asked me a leading question about him moving to the U.K. to live with me, but that isn’t true, I told him the plan is for me to move to the states with him because it’s easier that way. He then ended the call, saying keep my phone by me as he may need to get in touch again. In the end, the IO told him before letting him through, that he was letting him go because he was honest in telling the officer that he had been denied a visa. Before hand, he was advised by me, my parents and 3 people on the way to the U.K. not to bring it up. I guess honesty really is the best policy on this case. Can he be let in? Yes, definitely! However, he will be confronted at the border about his visa refusal, and will need to bring every piece of documentation he can to address whatever issue caused the visa rejection. For example, if he was refused based on lack of ties to the US, he needs all documentation proving ties to the US, such as proof of family, apartment contract, proof of his upcoming enrollment in school...all of it, everything there is. Please upload his refusal letter, blacking out personal details, so we can establish the root of this. UPDATE: Your boyfriend will need to be bloody well-prepared if going the visa-free route, and to be honest with you, you should at the very least shorten his visit to absolutely no more than 2 months (in other words, he should modify his return ticket), and then he should wait at least a year before entering the UK for any extended period of time. that his circumstances will force him to return to the US, and that he will do so within the stated period of time. Also bring the original visa refusal letter. Then he should be prepared for hours of detention, because like I said, while they may well land him (local jargon for admitting someone) if he does this exactly right, they almost certainly won't do so summarily. Have a look at this post, and not least the "DOCUMENTS I CARRIED ALONG" section. Like I said, this is doable at least if cutting down the visit to max 2 months (ideally 1 month), but he needs to be bloody well-prepared. Not the answer you're looking for? Browse other questions tagged visas uk customs-and-immigration visa-refusals us-citizens or ask your own question. Can you leave the U.K. and return on a standard visa? Can a 15 year old who was refused a visa still travel to the UK? Can a relative not based in the U.K. sponsor me for U.K. visitor visa?